Many years ago, when I was perhaps 5 years old, my dad was driving my brother and me somewhere in downtown Detroit, which, in retrospect, I realize was somewhere near Woodward Avenue and Campus Martius, where there is planned slowing due to a circular pattern to streets in that area (an interesting fun fact about the street layout in downtown Detroit, it was designed by Augustus B. Woodward, who used Pierre Charles L’Enfant’s model for Washington DC, meaning that this is not a grid pattern, as is the case in cities like New York and Chicago). I looked out the window of the Pontiac Catalina and saw something that I will not forget: There was a black horse pulling a black wagon being driven by a man dressed all in black, including a black stovepipe hat. The wagon was carrying a black. . .casket. This, I was to learn, was a stunt for a movie that was being shown at the Fox Theatre, The Premature Burial, which was based on a story by Edgar Allen Poe. Appropriate. Memorable. And the sort of thing that isn’t executed much or as well today. In support of the Moving On! 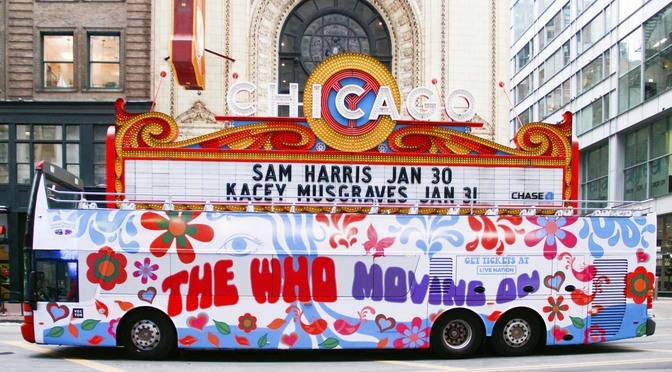 Tour there are three buses—the sorts of things that are the jump-on, jump-off tourist variety—that are painted with a scheme that resembles the bus on the cover of the 1968 album Magic Bus—The Who On Tour that are rolling in Chicago, New York and LA for the next couple weeks. The scheme here is for people to post pictures on Instagram or Twitter using the specified hashtag and by following LiveNation (the tour promoter) in hopes of winning two “premium tickets.” It is not clear what level tickets are going to be distributed. 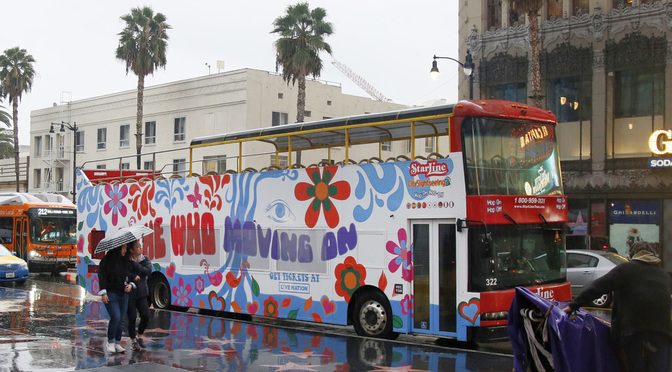 This got me to thinking about the album Magic Bus—The Who On Tour. As explained in the previous post on the subject of The Who, there is a bit of probable misdirection involved in the benefits of the special ticketing packages on offer. Chances are those buying the deluxe packages are not going to be sitting down with Pete and Roger for a bit of pre-show chin-wagging. Those of you who are not familiar with Magic Bus—The Who On Tour might assume that it is probably like the album that came out two years later, Live at Leeds, quite possibly to live albums what Quadrophenia is to studio executions. And given the title of the album, that assumption would be warranted. But it is not a live album. It is an American compilation of studio recordings, including B-sides from singles. Seems like a bit of marketing prestidigitation has long been an approach of the band. Some things are scary. Some things are sad. This must be what Pete-Roger were singing about on My Generation. Better to die young than get old and gripe endlessly about a senior band’s marketing strategy. That said, I’m glad you’re still with us, Stephen. 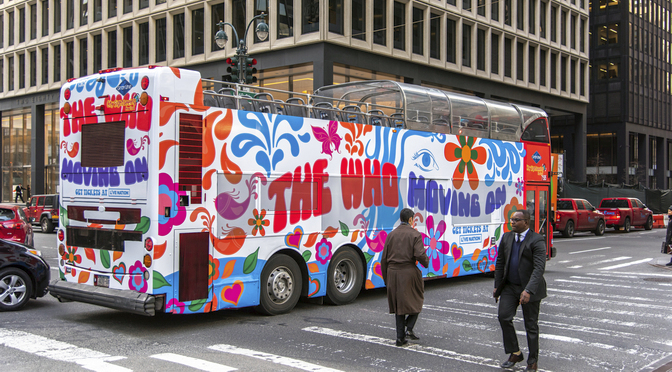 The phrase in “My Generation” that precedes the premature death comment is “Things they do look awful c-c-cold,” which is, I think, exactly what dubious ticket packages and faux Magic Buses are: stone-cold cold. Yes, this is marketing pure and simple. And the question is whether Pete and Roger really need to be stomping on the wonderful legacy that they created by allowing their marketing people to do such things. Who are they addressing with the “Who Are You” premium seat or the Magic Buses? Certainly not a generation that is unfamiliar with them, but those who grew up with their music. And so the marketing, such as it is, is a bad, sad joke. Yes, as everyone knows the money in music today is not in the digital file or the physical artifact, but in the performance and the merch. But after all these years, is it really about making more money for Pete and Roger. Is this just a “job” for them? Is it about profit maximization? If it is about the music, then why is there a need to whore out one’s past with gimmicks? Why isn’t it a case of playing in small clubs? Why isn’t it just the music, pure and easy? If it is about the money, then so be it. But I doubt that. And find it incredibly sad. Why don’t they just. . .fade away. . .? I mean, just look at the publicity photos they sent to the media. How sad are those empty buses? It’s even raining in Los Angeles!